A town in Iceland wants the state to step in and stop a local island from becoming private property. Ísafjarðarbær council has asked the environment and natural resources ministry to buy Vigur island in the country's scenic Western Fjords, in a bid to ensure that the nature-lovers can still visit, Iceland's RUV public broadcaster reports. The council is worried that a private buyer will not allow public access to "this natural treasure in Ísafjarðardjúp fjord", as it wrote in its formal application to the ministry. Vigur's 45 hectares (111 acres) have been for sale since last spring, and Davíð Ólafsson of the Borg estate agency told RUV that interest is running high - he received 30 enquiries about it last month alone - all from abroad. Most potential buyers live in the United States, and "many want to know about helicopter access to the island", he said. Vigur has become a popular tourist attraction in recent years because of both its heritage and its natural beauty, attracting more than 10,000 visitors in the summer months. The island is an important nesting site for puffins and eider ducks, and is also home to Iceland's only windmill - a protected monument that dates back to the 1860s, that was in operation until 1917. Iceland's smallest post office is to be found on Vigur, as is its oldest boat. 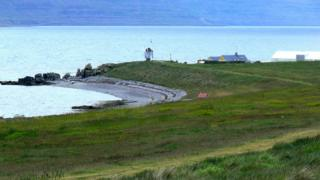 Built in 1800, the boat was used to transport sheep to the mainland until 19 years ago, and is still in good condition. The town elders of Ísafjarðarbær are not the first politicians to call on the government to act over Vigur. In September, local MP Halla Signý Kristjánsdóttir raised the alarm over the amount of potentially productive land being sold to foreign investors, not to mention in areas of natural beauty. "It is a unique natural treasure and historical site. We call it the pearl of the Western Fjords," she told RUV. "Common sense demands that the state should buy Vigur". The price is certainly steep for an individual buyer - the local business paper Viðskiptablaðið says the reserve price is 300m kronur (£1.9m; $2.5m) - but the small harbour boasts a cafe, restaurant and ten-bedroom hostel. But there may not be many foreign takers for the smokehouse, where you can prepare your own hangikjöt - the smoked lamb, mutton or horsemeat delicacy traditionally eaten at Christmas.